Kate Buckley’s strong interest in cardiac repair began when she was introduced to the field by her mentor, Dr. Mike Regnier. Kate has been passionate about research since she arrived in the lab in the fall of her freshman year, and is motivated by a continuing interest in the therapies she investigates and the constant need for translational research that aims to address current health problems. Kate is particularly interested in creating genetic and cellular therapies in cardiac muscle that could be applied to different forms of heart disease. The Washington Research Foundation Fellowship has given her the opportunity to explore a novel research question that will allow her to delve deeper into the exciting opportunities that research offers. In addition to research, Kate enjoys traveling and being actively involved in the Bioengineering program and the Honors Program. Kate is an avid learner and is constantly seeking new applications for her training as a bioengineer and research scientist. After graduating, Kate plans train as a physician-scientist in an MD/PhD program. She aims to one day perform clinically applicable research and teach students in the field of bioengineering and physiology. Abstract: Heart disease is currently the leading cause of death in the United States, killing over half a million people every year. One of the most common forms of heart disease is the heart attack (cardiac infarction). After a cardiac infarction occurs, the heart undergoes an extensive remodeling process in which normal cardiovascular function is disrupted. Gene-based therapies offer an alternative to current treatments as a method to improve cardiac function post-cardiac infarction. The genetic therapy L48Q in cardiac Troponin C offers potential as a therapeutic tool by enhancing Ca2+ binding within cardiac muscle tissue upon contraction, which may halt or even reverse the deleterious remodeling process by altering contractile properties within the myofilament. Current studies in virally tranfected rat cardiomyocytes have shown that that cTnC L48Q enhances contractile properties by increasing the amplitude of contraction in normal cells by 50% and increasing the rate of contraction by 55%, but the effect of this genetic therapy in the whole organ is unknown. To study the action of cTnC L48Q in the whole heart in the normal and infarcted hearts, both in vivo and in vitro methods will be utilized. Functional changes in vivo will be investigated using echocardiography to obtain measurements of ventricular diameter, ejection fraction, and fractional shortening. In vitro studies will be conducted using a modified Langendorff isolated working heart preparation to measure the preload responsiveness of the heart and the adrenergic responsiveness of normal and infarcted hearts after transfection with cTnC L48Q. Additionally, functional measurements in demembranated muscle strips will investigate contractile changes. The in vivo and the in vitro studies of the whole organ will provide a comprehensive functional assessment of the genetic therapy in the whole organ, providing essential information about the future feasibility of this therapeutic for use as a clinical treatment for heart disease. Once I entered the undergraduate program in the Department of Bioengineering, I was eager to begin participating in research that integrates new technology and biology. 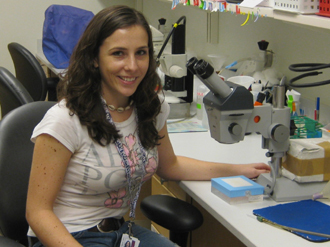 During the summer after my sophomore year, I began performing research in Professor Valerie Daggett’s lab. 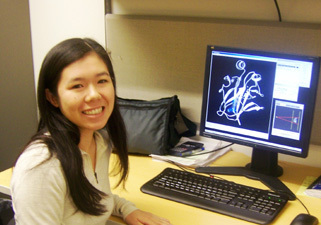 The Daggett Lab performs molecular dynamics simulations of proteins and applies computational approaches to investigate biomedical problems on the molecular level. 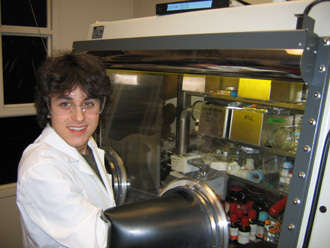 In the lab, I have participated in projects at different points in the development of methods for rational drug design. 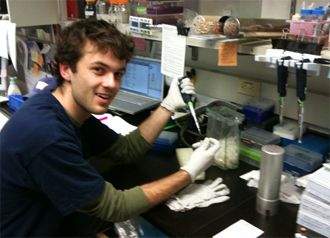 My experience working in the Daggett Lab has enhanced my interest in solving medical problems from a computational approach. After graduation, I intend to continue my research with Professor Daggett as I apply to graduate programs in computational biology. My hope is to contribute to the biomedical sciences through a long-term career in research. I am grateful for the funding provided through the WRFF and the support to achieve my goals. Abstract: The tumor suppressor p53 is a transcription factor involved in many important signaling pathways, such as apoptosis and cell-cycle arrest. Over half of human cancers lose p53 function by a single nucleotide mutation in its gene. Although structures of some p53 mutants have not been determined experimentally due to low structural stability, the structural effects of a single amino-acid change can be predicted using molecular dynamics (MD) simulations. Different single amino-acid changes in the core domain of the protein result in a variety of structural changes. Previous experimental studies suggest that p53 mutants that affect the overall stability are potential targets for drug rescue by a small molecule drug. Using computational structure-based drug design, an anticancer drug will be developed to target p53 mutants and rescue their function by stabilizing the protein structure. Virtual screening of a small molecule database can be used to limit the number of potential drug candidates. Docking runs can be used to determine drug candidates with the most potential for targeting p53 mutants. Docking programs are useful to find the most energetically favorable binding modes and calculating the binding energies of a molecule to the protein. Simulations of p53 mutants bound to drug compounds that are selected after virtual screening, and experimental work will validate the results of the simulations. Based on simulations and experiments, modifications will be made to the designs in order to improve binding affinity and its effectiveness in stabilizing the protein structure. After a series of modifications and evaluations, the goal is to produce a final drug design that will bind p53 mutants with high affinity and improve the overall thermodynamic stability of p53 mutants. Since I was young I have always been enamored with the idea of being a person who, wielding only knowledge of how the world works could innovate and create new things. So it was no surprise that I sought out a research position early on in my education. 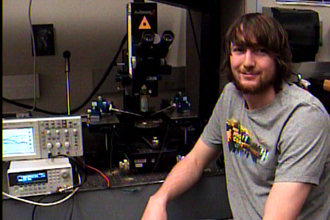 I started working in Professor Karl Böhringer’s Micro Electro Mechanical Systems (MEMS) Lab over 30 months ago, and it has been a life changing experience. For the first several months I was mentored by a Post Doctorate Researcher, but when he abruptly left for industry I took over the project relating to a droplet transport Lab-on-a-Chip technology, which I have worked on ever since. My undergraduate research has been littered with extraordinary opportunities and experiences which have positively shaped me both as scientist and as an adult. My most memorable experiences have been the ones that sent me abroad. Two summers ago I conducted research at the University of Tokyo, and last winter I presented a paper at a conference in Sorrento, Italy. This winter I will present another paper in Hong Kong. At the end of this academic year I will graduate with an Electrical Engineering degree with an emphasis on Biomedical instrumentation. I plan on pursuing a PhD in Bioengineering and would like my thesis to be related to Biomedical Devices / Bio-MEMS. Abstract: Advancement of lab-on-a-chip technology over the last decade has opened the eyes of both scientists and philanthropists alike at the potential of portable medicine. The robust, low power consumption lab-on-a-chip device I am currently researching combines immunoassay and electrochemical detection of nanoparticles within a micro-channel in the hope of developing a portable diagnostic device. Immunoassay is a promising approach in diagnostics due to the high specificity of the antigen-antibody binding mechanism. The most prevalent method for the detection of the immuno-complexation, formed when the antigen and antibody hybridize, is fluorescence microscopy. While the use of fluorescence markers is exceptionally useful for detection in a lab it is not well suited for a portable device. We propose an alternate method which can be done completely inside a micro-channel, using electrochemically detectible nanoparticles. The working principle of our device requires the use of two nanoparticles, one nanoparticle functions to immobilize the antigen against an electrode, while the other tags antigens with a corresponding metallic electrochemically detectible nanoparticle. The first of these steps will be achieved by an induced magnetic field and a magnetic nanoparticle. The second nanoparticle will be detected through the common electrochemical procedure Scanning Voltammetric Analysis (SVA). In SVA a metal is deposited and stripped from the surface of an electrode, while the amount of current induced during stripping is linearly related to the concentration of the metal in the micro-channel. In our detection system, where each metallic nanoparticle corresponds to the presence of one antigen, the number of antigens in the micro- channel can be extrapolated from the SVA current measurement. I knew I enjoyed chemistry when I entered the UW, but didn’t decide to major in it until I took the honors introductory chemistry sequence. The sequence was well-taught and helped me become excited about chemistry through the demonstrations and labs. The class also introduced me to the possibility of participating in research in chemistry. I contacted several professors, and eventually decided to work with Professor David Ginger, one of my professors in the aforementioned course. Over the past year, I have been able to work directly with Professor Ginger and the graduate students, postdoctoral fellows, and other undergraduates in his lab. I think this direct connection to experts in my field of study has been invaluable to my development as a scientist. In addition, being able to apply concepts learned in my chemistry, math, and physics classes has added depth to my education. Finally, I have learned a lot about organic photovoltaics, an exciting and important field. Being able to work on real research projects across a diversity of topics is a major benefit of attending a large research institution like the UW. I feel that I have been able to engage my education much more effectively by choosing to participate in research, and I thank the Washington Research Foundation Fellowship for supporting this important facet of my education. Abstract: Generating electricity from sunlight would be an attractive solution to our current energy problems. However, the high cost of processing the materials for silicon photovoltaics has limited the widespread use of this technology. Solution processable organic semiconductors could offer an inexpensive route to utilizing this clean and abundant energy source, but devices made from these materials are currently too inefficient to be economically viable. Photovoltaic devices utilize energy from an absorbed photon to generate free charge carriers, producing an electric current. Some losses in efficiency may occur during the separation of charge carriers, which is driven by the built-in electric field of the device. We have measured this field directly using electroabsorption spectroscopy. Initial measurements on sequentially deposited indium tin oxide (ITO)/polymer/metal structures have indicated that the built-in field follows the difference in electrode work functions, for contacts with work functions within the polymer energy gap. Future work will focus on correlating built-in field measurements of more complex device structures with electrode work function and device efficiency. As a little girl, every morning, I would run down the stairs and skip into the “hospital-smelling” hallway that connected to my father’s clinic in a rural village in Taiwan, and proceed to be underfoot with my curiosity. From an early age, I have always been interested in understanding the intricacies of cellular mechanisms that cause disease. Beginning research with Dr. Merrill Hille in my freshman year at the UW has only increased my excitement for designing and conducting new experiments and elucidating biochemical pathways that induce biological functions. I am now applying for MD/PhD programs in hopes of being able to provide both immediate medical attention and the possibility of new treatments for my patients. I hope that my research training will assist me in performing human genetics translational research, particularly identifying genetic malformations and how they confer a mechanism for disease at the molecular level. I am especially interested in early onset forms of psychological/neurological diseases such as epilepsy, autism, and schizophrenia. Ultimately, I also hope to take part in introducing novel genetic therapies to my patients. Abstract: Gastrulation is a crucial step in embryogenesis, creating differentiation between ectoderm, mesoderm, and endoderm and forming necessary organs. On the molecular level, transmembrane and juxtamembrane proteins located at the adherens junction, such as cadherins and p120 catenin respectively, work together to either promote cell motility or adhesion, which we study using the zebrafish embryo model. We hypothesized that when p120 catenin is at the plasma membrane, it binds and stabilizes the cadherins, causing cell clustering and increased adhesion, and when p120 catenin is in the cytoplasm, it activates Rad and inhibits RhoA (two RhoGTPases), which causes cell motility. By morpholino induced knockdown, we found that p120 catenin depletion caused defects consistent with the loss of cellular migration. In addition, increasing levels of Rad mRNA in embryos create abnormal embryos, but Rad mRNA in moderation has the ability to rescue p120 catenin-depleted embryos. These results demonstrate that p120 catenin is crucial for normal cell motility in developing zebrafish embryos and suggest that a balance of p120 catenin and Rad is also necessary for normal embryogenesis. These studies on the regulation of cell motility can help to elucidate larger signaling pathways, leading to additional effects on cell survival, growth, and invasiveness, all of which may be caused by the upstream p120 catenin. I entered the UW four years ago through the Robinson Center Early Entrance Program. since I was in elementary school I have known that I wanted to pursue a career in the health sciences and my initial experiences in general chemistry served to strengthen my interest in medical research. I decided to declare a major in biochemistry. During my subsequent introductory biology and organic chemistry classes I developed a deep interest in biotechnology. Two years ago I joined Dr. Daniel Chiu’s lab in the Chemistry Department in order to further explore biotechnology. 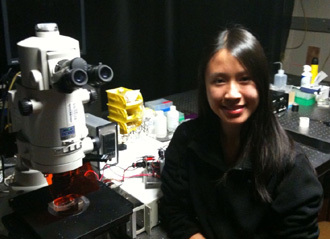 The Chiu lab specializes in microfluidics, which is essentially the manipulation of miniscule amounts of fluid (on the order of microliters through femtoliters). Specifically, I work with microchips, which are polymer-based machines set with channels and other features that can be used to carry out chemical and biological reactions on a small scale. After I graduate from UW, I hope to pursue an MD/PhD since I am extremely interested in the interface between the laboratory and the practice of medicine. Specifically, I hope to expand and apply my knowledge in microfluidics to my interest in infectious disease, perhaps by exploring how microfluidic technology can be used in a clinical setting. In addition to majoring in biochemistry, I am pursuing a minor in history. I am also an Amgen Scholar and a member of the UW College Honors Program as well as the vice president of the UW Chapter of the Golden Key National Honor Society. I am a native resident of Seattle. My hobbies include cooking, calligraphy, attending the ballet, and playing the piano. I also enjoy tennis, biking, and hiking. Abstract: Due to the plentiful and diverse solutes found in cells, solute-solute interactions are an important part of cellular chemistry. In 2003, Zheng and Pollack observed that charged microspheres suspended in water avoided a region up to 100 μm away from a gel-water boundary. This suggests that solute-solute interactions extend for a much larger distance than previously believed. Although the mechanism of this “exclusion zone” phenomenon is unclear, one possible cause is the presence of a pH gradient around the gel-water boundary, which could have exerted a force on the charged microspheres directed away from the boundary. The Chiu lab seeks to test the viability of the pH gradient theory as an explanation of the exclusion zone phenomenon. The experiment is conducted on microfluidic chips, which are blocks of polymer engraved with channels, chambers, and other features and faced with glass. The experiment consists of two general stages: firstly, a pH gradient is established inside a microfluidic channel via the laminar flow of phosphate buffers with differing pH. Secondly, the behavior of charged microspheres is observed with respect to the pH boundary via microscopy. The preference of the charged microspheres for one side of the pH gradient would confirm pH gradients as the cause of exclusion zones, thus significantly contributing to current scientific knowledge of solute-solute interactions and cellular chemistry. Specifically, the forces caused by a pH gradient could be used to understand cellular chemotaxis: a cellular transport mechanism where the cells migrate towards areas of lower pH to escape their own metabolic waste products. Ultimately, this research could be the basis of a novel microfluidic purification method which uses pH gradients as the basis to separate the components of extremely small chemical mixtures by charge. My experience in the biological sciences began formally in the third grade, when I, and a dozen fellow homeschoolers, spent a year dissecting such animals as sharks, pigeons, and fetal pigs in my family’s garage. That class led me, the very same year, to check out every library book I could find on Charles Darwin. I thought: how great would that be to travel around the world, study nature, and come up with cool theories like evolution? Yet while these early introductions quickly led to a persistent interest in all things biology, a career in scientific discovery didn’t occur to me. I certainly never imagined it was possible to uncover new insights into the way we understand evolution. All that changed when I entered the University of Washington. Surrounded by cutting edge research, excellent faculty, and interesting classes, I discovered a new culture I’d never been exposed to: a certain way of asking, answering, and communicating scientific questions. Today, I am happily on my way to becoming a part of that culture through my own research in the Queitsch Lab in the Department of Genome Sciences. In following with my old fascination of Darwin and evolution, I am working on understanding some of the molecular processes that contribute to phenotypic robustness and facilitate evolution. This work has been both exciting and challenging. More than anything, it has given me the confidence to pursue a career in the biological sciences. I feel very fortunate to have the support of a Washington Research Foundation Fellowship to carry on with my work in the Queitsch Lab. In the future I hope to continue research in the biological sciences, while also incorporating a newfound interest in teaching. Perhaps eventually I will travel around the world, study nature, and come up with cool theories like evolution. Abstract: A considerable amount of genetic variation exists among organisms of the same species, yet the variability of their phenotype is minimal. The protein Hsp90 has been shown to play a role in maintaining this phenotypic robustness by buffering genetic variation and keeping it phenotypically silent. When Hsp90 function is decreased by mutation or environmental stress, previously cryptic genetic variation is expressed, thereby significantly affecting phenotype. The existence of frequently occurring cryptic genetic variation together with a plausible natural release mechanism – environmental stress – likely facilitates evolutionary processes. Hsp90 allows phenotypes to remain robust over 1) the course of a lifetime, e.g. in the face of environmental changes such as weather or disease, and 2) over many generations, e.g. in the face of inherited genetic variants or mutations. Based on the properties of Hsp90, I hypothesize that there are other proteins that similarly maintain phenotypic robustness and I hope to identify the genes encoding them. The Queitsch lab has identified several candidate genes in the small RNA pathway that maintain robustness in seedling traits of the plant Arabidopsis thaliana. To date, I have focused on creating conditional knock-out mutants for these candidate genes. Once I have characterized these mutants, I will test their ability to maintain phenotypic robustness in and buffer genetic variation. 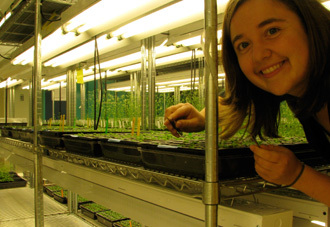 My experiments will compare many individual Arabidopsis plants of precise genotypes in different environments under highly controlled conditions. By analyzing the resulting phenotypes and associating them with the tested genotypes, I will be able to determine if my conditional mutants disrupt phenotypic robustness and release cryptic genetic variants. My work will contribute to a better understanding of the molecular mechanisms contributing to phenotypic robustness and it will yield insights into the molecular underpinning of evolutionary processes. Growing up with a brother with cystic fibrosis meant that genetics always played a profound role in my life. From a young age, I was fascinated by the field. I became involved in the Department of Bioengineering during my sophomore year because I was interested in developing the engineering skills required to design solutions to biomedical problems. 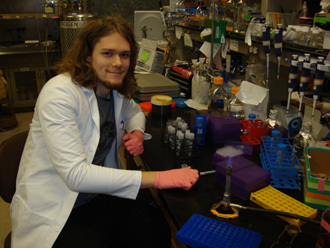 As I progressed through my major, I decided to pursue a position in a lab in the Department of Genome Sciences so that I could more directly research the topics that interest me. I am fortunate to be working under Dr. Celeste Berg, who has been extremely supportive of my research and has helped me come up with independent research projects. During my junior year, I received support from the Howard Hughes Medical Institute to study tubulogenesis, the formation of tubes from flat epithelial sheets of cells, at the genetic level. This process occurs during the development of essential organs, such as the heart, lungs, gut, kidneys, and neural tube. To fulfill the requirements of my senior capstone project, I am switching projects and am researching antibiotic toxicity. I am grateful to be receiving enabling support of the WRFF and Ronald E. McNair Program for this project. Having found my niche in research, I am applying to graduate school with hopes of obtaining my PhD in biomedical sciences, specifically in genetics or molecular, cell, and developmental biology. Abstract: Pseudomonas aeruginosa bacterial infections are a common problem in immune-deficient patients, such as burn victims, cancer patients, and cystic fibrosis patients. Treating these infections generally involves using an aminoglycosidic antibiotic, such as neomycin, which functions by blocking bacterial protein synthesis. Unfortunately, the range between effective treatment and toxicity is narrow. Patients treated long-term for P. aeruginosa infections often experience renal failure and deafness. The goal of this project is to develop the fruit fly, Drosophila melanogaster, as a model to understand the effects of neomycin treatment and to identify genes whose altered expression can help the fruit fly cope with the side effects of this drug. Knowledge gained from this type of study may facilitate development of a drug that targets P. aeruginosa infections with the same specificity but without the long-term side effects. Information from this study could also be used to ameliorate the side effects experienced by patients who are currently being treated with aminoglycosides. In order to develop this model, a dose-response curve of neomycin concentration to survivorship will be established. Then, I will analyze which tissues are affected by high doses of neomycin treatment by using molecular bioengineering techniques to insert an antibiotic resistance gene into flies. Using the GAL4- UAS system, a transgenic tool that allows Drosophila researchers to control when, where, and what is expressed, I will systematically drive this antibiotic resistance gene through various tissues in the flies. This will allow me to determine where the gene is essential for survival. Finally, I will perform a genetic screen using interference RNA to knock down expression of genes potentially involved in aiding aminoglycoside toxicity. Information gained from this screen will be useful for drug developers in the future, and may be used to develop diagnostics such as a microarray for determining the optimal route of therapy. I am currently a junior studying civil and environmental engineering. I was first introduced to fluid mechanics last fall in an introductory fluid mechanics course taught by my current research mentor, professor Alex Horner-Devine. I developed a strong interest in the subject, and by the end of the quarter I managed to convince professor Horner-Devine to take me on as an undergraduate researcher. I have greatly enjoyed the challenge presented by working on independent research – as a highly motivated student, it has been extremely rewarding tackling open-ended problems where you are responsible for the development of a question and the interpretation of the results. 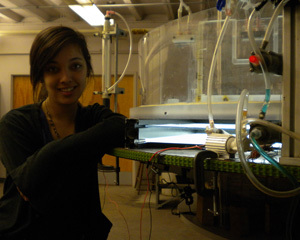 I am involved with the Environmental Fluid Mechanics research group here at UW, where I have been fortunate to find great support and motivation through the other graduate and post-doctorate students. My work to this point has consisted of laboratory experiments simulating coastal river plumes in the Harris Hydraulics Laboratory. I am honored to have been chosen as a recipient for the Washington Research Foundation Fellowships and I am extremely grateful for the opportunity to continue with the research I have been involved in. Abstract: In environmental engineering, it is essential to understand the manner in which water transports nutrients, contaminants, and other particles that affect the health of aquatic systems. The chemical and biological processes related to these substances are dependent on the residence time of the particular constituent and often proceed exponentially, making them sensitive to small variations in the age of a fluid parcel in the system. In practice, residence time is difficult to measure and is often estimated by a quantity known as hydraulic residence time, which represents a case of ideal behavior. However, in environmental flows, vortices and other singularities often cause large deviations from the ideal case, causing this to be an inaccurate representation of actual residence time. In the present experiment the spatial distribution of age is studied for the specific case of a coastal river plume. In order to measure two-dimensional fields of age, a new technique that uses linear mixing of two different color dyes to create a timescale has been developed. This timescale is applied to images of the flow to map age. The age fields will be compared to analytically determined average age distributions for idealized plume models in order to compare the structure of the experimental plume to theoretical examples. This experiment will provide data about age fields in coastal river plumes, which is relevant in the consideration of sediment loading into the oceans. It will also provide a basis for understanding how coherent structures in the flow are affecting age distributions. Results suggest that older fluid is trapped in the center of the plume while new, younger fluid circulates around the bulge perimeter. Overtime, however, instabilities that develop in the plume are thought to increase the amount of mixing within the bulge. My passion for tinkering with microscopic life was first cultivated at a young age in the makeshift garage laboratories of my adolescence. 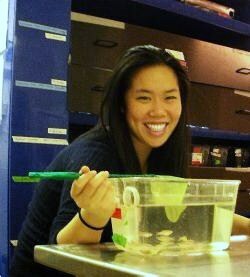 From those roots of cataloging the protozoan I found in the rain puddles of my backyard to cooking up homemade bacterial media in my kitchen, I didn’t waste time getting started on formal research once I was accepted into the UW. 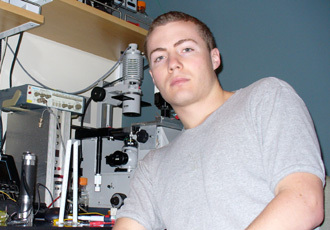 The summer before I began my freshman year, I joined the bioengineering lab of Gerald Pollack. During the year that I spent in his lab working on probing the physical properties of interfacial water, I learned a great deal about applying the concepts learned in the classroom to problems faced in my research work. After bouncing around a couple of other labs, I was fortunate enough to land in the biochemistry lab of David Baker. Now I am in the midst of a challenging, yet rewarding research project that will also become my senior thesis work. The Washington Research Foundation Fellowship has afforded me the opportunity to purse this project with the best of my abilities, and I am incredibly thankful and humbled to have received such a reward. It has further motivated me and will be a propelling force that will drive me into graduate school. After graduate study, I hope to enter industry with the eventual dream of starting my own biotech company. Abstract: My project seeks to design and create a novel human enzyme, cytosine deaminase, for use in prodrug therapy. Cytosine deaminase catalyzes the deamination of cytosine, converting it into uracil. There is clinical need for a human cytosine deaminase for use as a prodrug activator in suicide gene therapy, where a cytosine deaminase can catalyze the reaction of the cytosine derivative 5-fiuorocytosine (a harmless chemical) into 5-fluorouracil (a cytotoxin). While there are cytosine deaminases that exist in nature, there is no human enzyme capable of catalyzing this reaction. The use of non-human enzymes in prodrug therapy often fails due to the immunogenicity issues that often arise. Therefore, by taking a human enzyme and altering its activity such that it can catalyze the deamination of cytosine, these immunogenicity issues can be avoided. In order to engineer a novel human cytosine deaminase (hCDA) I will build upon previous work that successfully re-engineered a human guanine deaminase (hGDA) to have ammelide deaminase (hAmDA) activity. Since there is considerable structural homology between guanine, ammelide, and cytosine, re-engineering this previously designed ammelide deaminase enzyme to have activity on cytosine should be possible. To do this, I will be using a Rational Design approach aided by computational simulation to alter the active site residues of the previously designed enzyme to better match the active site structure of a bacterial cytosine deaminase (bCD). This will create an active site more complementary to cytosine and hopefully introduce novel cytosine deaminase activity. My interests in bioengineering stemmed from my training to become an emergency Medical Technician. This training exposed me to the magic of emergency medicine, but also revealed to me the shortcomings of the industry. It is my belief that many of these shortcomings can be eliminated through the development of novel biomedical technologies that put the power of the hospitals into the hands of the paramedics. The products of my current work should find applications in this regard. My first experience in research was with Dr. Bassingthwiaghte and the National Simulation Resource. There, I learned to develop mathematical models of blood flow through the heart. I now work with Dr. Lutz and Dr. Yager in a microfluidics lab where the focus is on the development of solutions for home healthcare and distributed diagnostics. My research experience has been a tremendous supplement to my undergraduate education and has helped to define my future goals. After graduating from the University’s Bioengineering Department I plan to pursue a medical degree. Thank you to the Washington Research Foundation and to the Washington NASA Space Grant Consortium for their support of my efforts. Abstract: Microfluidic devices have shown great potential for providing point-of-care (POC) solutions for diagnostics, food and environmental safety, and forensics 1,2 . 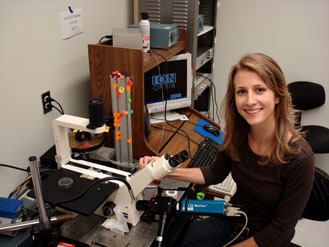 At the same time, their impact on these fields has been limited by their general requirement for the supporting behaviors of bulky and expensive laboratory equipment such as computers and air pumps. The elimination of a device’s dependency on this peripheral equipment is perhaps the greatest challenge in developing marketable POC solutions for the home or for the developing world. In an effort to provide a platform for the construction of microfluidic technologies with reduced laboratory dependencies, the proposed project aims to produce an on-card fluid delivery system suitable for use away from the lab. This system will be capable of directing a multi-step assay and to operate will require only an electrical input of variable frequency. Because this input can be provided by a cell phone, or some other similar piece of personal equipment, the system will allow for devices that are practical for use in the home or in the field. The system will employ fluidic oscillators, analogous to AC electrical circuits, with piezoelectric actuators to give frequency-specific flow control 3-4 . Constructed from mostly glass and plastic materials, the envisioned system offers the benefits of small size, low-cost manufacturing, portability, and durability. These are benefits that simply cannot be provided by the more typical laboratory fluid control systems which employ large and expensive pumps to drive fluid and open or close on-card valves 5 ‘ 8 . In contrast to paper-based microfluidic products, the system should offer high operating speeds and be tolerant of a wide range of chemical reagents. A successful project effort will yield a product with the potential to elicit the commercialization of any number of microfluidic technologies currently tethered to the laboratory environment. I am a graduating senior in the department of microbiology. I began my research career two and a half years ago in Dr. Nancy Haigwood’s lab working on HIV vaccine development. I joined Dr. Julie Overbaugh’s lab a year and a half ago when Dr. Haigwood moved to OHSU. When I joined Dr. Overbaugh’s lab I began my current project looking at different in vitro construction techniques of HIV. There are several widely used virus construction techniques. However, there has been very little direct comparison of these systems to confirm that results generated in each system are comparable. My project’s goal is to directly compare these systems so that results from other studies that use each of these systems can be compared. The experiences of working on an independent project have exposed me to countless opportunities and an absolute love of scientific research. Recently, my research gave me the chance to travel to the 16th Annual West Coast Retrovirus Conference in Palm Springs, CA to present my findings. Upon completing my undergraduate degree I plan to pursue a Ph.D. in HIV research. I am very grateful for receiving a Washington Research Foundation Fellowship, as it will allow me to continue my research during my senior year and complete my project before I graduate. Abstract: Since human immunodeficiency virus type I (HIV-l) came under study over 25 years ago the goal of many vaccine attempts has been the elicitation of neutralizing antibodies (NAbs), which are widely believed to be the immunizing force behind most successful vaccines. Historically, the gold standard for in vitro testing of NAbs has been the peripheral blood mononuclear cell (PBMC) based assay. Recently the pseudovirus (PV) neutralization assay, which addresses the shortcomings of the PBMC assay, has been put forward as a widely adopted alternative. Previous studies have demonstrated that genetically identical virus display different neutralization phenotypes when tested side-by-side in these two assays. There are several major differences between the two experimental systems, and it remains unclear which of these variables accounts for the discrepancies. In my study I propose a systematic way to determine what variable (or combination of variables) accounts for the differences in the two systems. The three variables under study are the cell type the virus is produce in (either tissue culture or PBMC), the target cell of the assay (either tissue culture or PBMC), and whether the virus capable of just one or multiple rounds of infection of the target cells. To accomplish these goals I have developed a panel of 13 genetically matched PV and replication competent chimeras, which are representative of global HIV biodiversity. This panel will allow for each variable to be isolated while all others are held constant Preliminary results, in good agreement with previously published data, demonstrate that the replication competency of the virus is not a variable that affects susceptibility to NAbs. Over the course of the next year I will elucidate what role the other factors play in determining neutralization phenotype.